Trading Hour Schedule for the US National Day of Mourning on 5th December 2018. Trading hours for CME Group U.S.-based equity products on Dec. 5 will include an abbreviated session, closing after overnight trading at 8:30 a.m. Central Time and reopening at their regularly scheduled times for a trade date of Dec. 6. Interest rate products will close at their regular times on Dec. 4 and will not reopen until their regularly scheduled times for the trade date of Dec. 6. Equity and interest rate options expiring on Wednesday, Dec. 5 will be moved to expire on Tuesday, Dec. 4, 2018. All other markets on CME Globex, CME ClearPort and the trading floor will remain open for regular trading hours on Dec. 5. 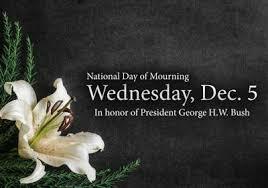 TO OBSERVE A MOMENT OF SILENCE IN HONOR OF GEORGE H. W. BUSH ON WEDNESDAY, DECEMBER 5, 2018 In recognition of the passing of President George H. W. Bush, the Exchange will observe a moment of silence at 8:18 am NY time on Wednesday, December 5, 2018.